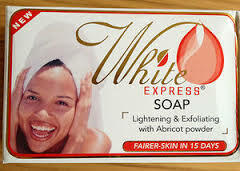 White Express Lightening Exfoliating Soap 7oz Easy White Express Lightening Soap Symbol of purity this high-quality soap eliminates dark and leaves the skin perfectly clean, soft, supple and visibly clearer. Use throughout the body. Avoid contact with eyes.